Do you have a story to tell? We love hearing how chiropractic care has enhanced our patients’ lives. Thank you for the work that you’re doing and the environment you’ve created at your office. It’s so wonderful to know that I have a place where I am cared for, being treated for my physical issues and also where my daughter (who is usually terrified of doctor offices) feels comfortable! Your staff is the best! I can’t say enough about how thankful I am to have found your practice! Walking in I immediately noticed that the staff knew everyone’s name as they walked in the door. You could tell that everyone in the office genuinely cares about each person who walks into the office. After sitting with Grace, Dr. Nick and Dr. Rick on my first and second visit, I knew that that would help me treat my current back pain, but also made me hopeful to resolve issues I have had for a majority of my life, my migraines. I look forward to coming in each time! Dr. Nick is awesome,very professional in every way. Grace & Jessie are always cheerful and welcoming. They both make you feel like a family member. I would highly recommend Innate to anyone needing health care. The staff is extremely wonderful, they are so kind and friendly. 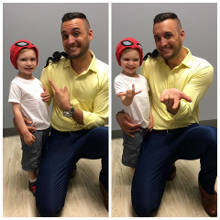 The doctors are very caring, my son immediately bonded with both Dr. Rick and Dr. Nick he was giving both of them hugs before the end of our very first visit and he usually shy with strangers. They are a blessing. After my first week of treatment my back and neck pain were drastically reduced. I am excited to see how much better i will feel in a few more weeks. The staff makes you feel like family. They take the time to explain everything in a manner you can understand. Fantastic experience and I hope everyone gives it a try. By far the most friendly committed healthcare staff I have ever experienced in my lifetime. I can’t begin to express how well cared for I felt and the knowledge and expertise of the entire staff was amazing. This is my choice for great care for the rest of my life. Everyone at Innate Health Chiropractic is super nice! On my first visit, I wondered if the staff was genuinely that kind and friendly. After a few visits and speaking with other patients, you learn that the staff are just amazing people. So kind and helpful. They truly want you to feel the best you can. Even on a busy, stressful day, it’s refreshing to walk into the office and interact with everyone. I highly recommend going to Innate Health Chiropractic. I am extremely confident that I am in good hands.The entire staff is so friendly, so helpful, and so knowledgeable that I don’t want to leave when my appointment is over. I love this place! I am SO glad I decided to give Innate Chiropractic a try! They are exactly the kind of practice I’ve been looking for. Dr. Nick is a skilled professional and his staff are kind and helpful. I have witnessed immediate positive results and I’m looking forward to more. In one week, I am making unexpected progress. I’ve been in pain for 5 years and in one week it’s already starting to decrease. Amazing! Innate Health has been AMAZING!! Dr. Rick has been able to help relieve my sciatica pain and some of my pregnancy back pain that I had been experiencing. I highly recommend them to anyone who is expecting or just needs some adjustments to relieve pain. They treat you like Family and the front office staff are like friends. We came to Dr. Nick with a very fussy and premature baby. We weren’t sure what to expect but sure had high hopes. Our little girl was in constant discomfort and often times, pain. She had been “diagnosed” with silent reflux. Our pediatrician explained to us that it is hard to diagnosis but all the symptoms were present. He gave us the option to start medication. 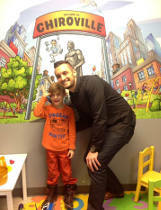 We discussed visiting Dr. Nick…he was on board with the decision. After just 1 visit, we had a brand new baby!!! After each visit, we are seeing more and more positive outcomes from Dr. Nick’s care. Thank you Dr. Nick and all the staff at Innate! We are so thankful for all that you have done for our precious babe. Above all else, the overwhelming joy you feel radiating from the staff makes me feel confident in my choice to bring my son to Innate. Everybody makes me feel wanted and welcomed and not like just another number on the wall. I’m very satisfied with the care provided. The staff listens with intention and not just to nod their heads. I don’t think I could have taken my son anywhere else to receive this level of care. As well, I’m truly encouraged when I walk in and see the foundation of faith being worn on their sleeve. Faith is important to our family and it just makes it that much better for us to be a part of this environment. Even in the short amount of time that we have been coming I have noticed a tremendous difference in the issues my son had been facing. I couldn’t be happier with the care he is receiving and I can’t repeat that enough. The staff at Innate have exceptional customer service skills. From my first phone call to my most recent visit, they are genuinely concerned with your goals and needs of care. I came in with a frustrating shoulder problem which restricted my range of motion, affecting my ability to pick up my son and a long list of other basic tasks. I began to see noticeable differences by my 3rd visit and by my 6th visit, full range of motion had returned. At first, I was nervous and alittle doubtful that this avenue of care would solve my problem, but it has. I am so thankful our family chose Innate and can’t wait to continue to see the benefits of chiropractic care for our entire family! “I was 36 weeks pregnant and my baby was breech. I wanted to avoid having an external cephalic version to turn him or a c-section. Someone suggested finding a chiropractor who specializes in the Webster Technique. does not cry and scream nearly as often as he used to. I’m sure this is because his neck is not causing him pain and discomfort anymore – he seems much happier in general! I found Innate Health Chiropractic online when I was pregnant. 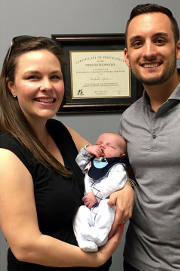 I was looking for a chiropractor that worked with pregnant women and when I saw that Dr. Nick was a Christian, I knew that I wanted to give the office a try! I really liked what they spoke of on their website about their beliefs. My husband had old sport injuries that were always flaring up, especially when we would work out. He was having limited motion in his shoulders because of it. He also was having hip issues with wearing his heavy police belt. He had always ignored his pain problems and just checked it up to playing ball. It was limiting his ability to work out, was affecting his sleep, and was constantly causing him pain. After our son was born, He was having difficulty eating and was also having problems with stomach pains. 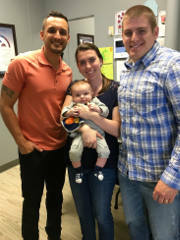 Chiropractic care has been great for our family! I had a great natural delivery and I’m feeling healthy. My husband has motion back in his shoulders again and is back to working out and feeling much better. Our son is growing like crazy and now eats like a champ! I love that the three of us get to now go together and make it a family affair! I came to Innate Health Chiropractic for a pain behind my shoulder blade and later told Dr. Nick that I had a tingling, burning sensation in my legs whenever I would do more than walking. This sensation in my legs started 2 ½ years ago and my back pain began this past fall. I could not move, exercise, practice, play, train, lift, walk up stairs – basically nothing that I did everyday of my life before the pain. I had various tests done, tried multiple vitamins and supplements, and therapies, but was still in pain. A friend referred me to Innate Health Chiropractic, and since beginning care under Dr. Nick, my leg pain is COMPLETELY GONE! I literally have been given my life back. I can do whatever I want again without pain! The first time I walked into the office, I was instantly impressed. There was Christian music playing, Grace knew my name when I walked in, and I was welcomed warmly. I started coming frequently and loved watching the documentaries and seminars playing in the warm up area. 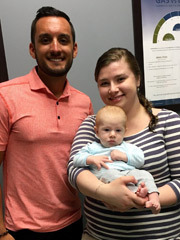 It arose so many questions in my mind about my future, and Dr. Nick was open to them and gave me so many answers that have helped me with nutrition, and Jessie was always a smiling face for me to walk into. The complete atmosphere and ideals of Chiropractic have made me totally flip my future plans around. 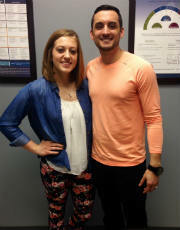 I am now planning to go to Chiropractic school to follow Dr. Nick’s footsteps in changing people’s lives! I am so blessed to have found Dr. Nick and Innate Health in general. They have truly given me my life back and saved it in other ways. I would recommend absolutely anyone to Innate Health because I have no doubt that they will have as great of an experience as I! 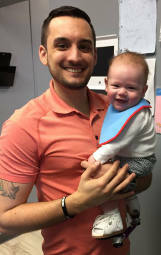 We brought our son in to see Dr. Nick at a little over a week old for wellness. He was born via c-section and we wanted him to get adjusted. He was having a hard time nursing, especially on one side. He latched on fine, but didn’t want to nurse. One day, I only nursed him twice. He seemed hungry, but just didn’t want to nurse. emotionally draining not only for our son, but also for us as parents! It was so hard to have him be so sick – putting him in the bath when his temperature was so high and seeing him in such pain. He had been extra whinny in the past 6 months, before starting chiropractic care. A friend recommended Innate Health Chiropractic to us, and since starting care we have experienced wonderful results! 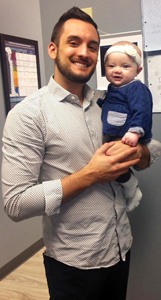 Our son has had NO ear infections so far since starting chiropractic care! Our biggest change that we have seen is that he is not waking up whining from his naps. He is playing more, playing independently, and is not as clingy. was causing him a lot of problems at school and with his friends. He was about to be kicked out of school as a kindergartner! He had also been a trouble maker when playing on sports teams because he couldn’t listen and follow directions. We have tried Occupational Therapy for sensory integration, as well as diet changes. The Occupational Therapy was helpful, but with limited short term results, and the diet changes were helpful but not enough. We have also tried Cranial Sacral Therapy with positive, but limited results. We came to Innate Health Chiropractic after hearing about them through a local moms Facebook group. Since starting care under Dr. Nick, our results have been amazing and life changing. Our son went from being extremely disruptive in the classroom and not getting much work done, to completing all of his areas and having bursts of learning in math and reading! His energy can still accelerate to levels that need brought down, but now with a reminder he can put the brakes on himself! 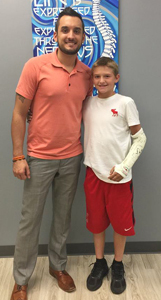 “Our son was born with clubbed feet and had to be in casts from 5 days old. He also had a lot of digestive/stomach issues pretty early on. We tried 4 or 5 different formulas to try and help with his belly issues but nothing really helped. He never had a bowel movement without screaming through it. He was just a fussy/gassy baby in general and cried a lot! He just did not seem to be happy unless he was being held and I knew that I could not start that habit. He hated to sleep on his back, so for the first month we held him while he slept or we put him in his swing because he did like that. We later discovered he slept so well on his belly that we just opted to have him sleep like that even though it is preached to not belly sleep. We needed our sanity also, so if this is how he slept best then we just let him. He was diagnosed with silent reflux around 2 months and we did see some improvement with the meds, but not too much. I was also concerned that maybe the heavy casts he wore on his legs were making it hard for him to go to the bathroom. Most babies can bring their legs up with a belly ache but he could not do that very well. expect her to give him 100% attention with other kids she also watches. We had our parents watch him more for that reason. hours at night, and having normal bowel movements without screaming. We have also been able to wean him off his reflux meds! He loves getting his adjustments also, he will laugh and smile at Dr. Nick the whole time! We are so pleased with his results and my husband and I can actually get sleep. We cannot say enough great things about this office! Everyone is so helpful and super nice. Grace, Jessie, and Dr. Nick have been so helpful with every question we have had. I would recommend Dr. Nick and his staff to anyone in a heartbeat! Thanks for everything you have done to make our little guy happy again! “Our son has always been a very energetic child. He had a hard time sitting still in school and focusing on the tasks at hand. He required sensory breaks throughout his day, as well as the use of a weighted vest during circle time and fidgets to keep his hands busy. Because of all these interventions needing to be put in place, we decided to have him tested for ADHD. Even though we knew it was coming, getting that ADHD diagnosis was difficult because we did not want to medicate our child, especially at the age of 5. We decided to try medication because, as teachers, we had seen how much it helped other children and hoped it would help him. It did. The difference was amazing. For a child who could not sit still for more than 2-3 minutes to sitting at the table for over an hour putting a puzzle together was unimaginable for us. We knew we made the best decision for us. As our son got older, he began to twist his hair when he was under a lot of stress or trying hard to concentrate. We were worried about this, but the doctor said as long as he wasn’t pulling his hair out it was okay. It was just his way of releasing his energy while focusing. He wasn’t pulling out his hair, so we ignored it and let it go. Fast forward 4 years, and he began twisting his hair again. However, this time he was pulling it out. He had twisted and pulled out so much hair that he had created a large bald spot on the front of his head. We were upset and frustrated because we did not know what to do to help him. We were looking into taking him to an ADHD clinic at Ohio State, Cleveland Clinic, basically anywhere we could get help. We did not want to increase the dosage of his meds or put him on other medications just to help this. We wanted to find an answer. that next day and he had his first visit only a few days later. 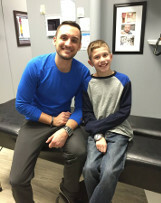 We began our journey with Dr. Nick in November and started seeing positive results in the first couple of weeks. Our son has since finished his initial care plan, but continues to go twice a month for wellness visits. Since going, he has stopped twisting his hair and has not needed any additional medication or increased dosages. “Bedtime has been an issue for many years, but 3 years ago it got even worse. Kanyon would have stomach aches and have trouble breathing at bed time. He would also wake up all through the night, waking up my husband and I. We were all exhausted and frustrated. He would get very upset because he wanted to sleep but his mind wouldn’t let him. At this point we were willing to try anything, so friend of ours suggested that we make an appointment to see Dr. Nick. “My daughter was daignosed with Acid Reflux at 5 weeks old. She was miserable and had inconsolable crying. We had to hold her upright 24 hours a day. Our family life suffered and we were all very sleep deprived and miserable. We even purchased a special necklace that was supposed to help with Acid Reflux, and she was put on a very high dose of Zantac 3x/day. I had read about chiropractic care for babies with reflux on a mom’s blog. I was desperate so I Google searched pediatric chiropractors and found Innate Health Chiropractic.Since starting care under Dr. Nick, my daughter is so much happier. I didn’t realize how unhappy she was until she became happy. Initially I was nervous and almost canceled my first appointment. But I had heard so many positive things from friends, that I decided to follow through with my appointment. Grace and Jessie were so welcoming and friendly, and the office had such a positive atmosphere. The testing that we did gave concrete evidence to support what I was experiencing symptom wise, and a measure to base progress on in addition to symptom relief. I felt extremely hopeful after the first visit, and even more hopeful after the second visit when Dr. Nick went over the testing and we developed a treatment plan. I am really looking forward to working with this group! Ready to get started? Call us at (419) 872-2255 today!